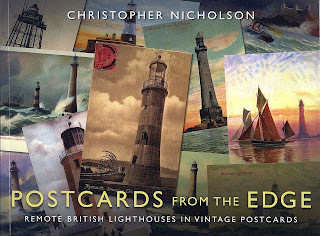 Postcard collections from 100 years ago (when postcards were used as e-mail is today before telephones became widespread) have been appearing in book form regularly over the last few years and this new book is devoted to the topic of British lighthouses. As is usual, the cards came in a variety of b/w, sepia toned and colored (as distinct from colour) versions. Although a small number of people expect old photos to look like they were taken yesterday, and can't understand why they don't, the 'olde-worlde' charm of vintage postcards is what gives them their appeal. Most of these lighthouses still exist today, although some have had ugly helicopter landing pads added to their tops. There are interesting stories attached to some of them. We like lighthouses wherever they are, and have a large number of models in our offices. In 1989 we co-published New Zealand Lighthouses and plan to bring out an updated e-book edition of it later this year. There are also two NZ lighthouse films as bonus features on our New Zealand Maritime Memories DVD.